Managed print services allow Caltronics to work with you in monitoring printer usage, how things are moving through the printer environment between all the computers connected to the network, how it is being used, and whether someone is scanning, copying, or printing. It can be far too time-consuming to take the time out of your own day to try to manage how the printers are being used. The Caltronics team of experts can do that work for you and help give you ways to make changes when necessary. You will be able to see trends in usage, both during the day and in longer time intervals. With Caltronics’s managed print services, you also will not need to worry about trying to figure out how to deal with that random paper jam that does not seem to actually exist. If an issue ever does occur with your Konica Minolta or HP printer, the professionals at Caltronics will be ready to get out to your office and help you out any time during the work day. Document workflow is another great service that offers tremendous value for an active and growing company. Caltronics can help you move from paper-based to cloud-based filing in order to increase efficiency and improve access to vital documents. Caltronics Business Systems sets itself apart with its dedication to customer service through services like managed print services. No other company can match the accessibility and knowledge that Caltronics has come to be known for over the years. If you are interested in learning how Caltronics can help your office, contact them today. This entry was posted in Uncategorized on March 29, 2017 by riehlt. Faxing is still in use by many businesses across the United States thanks to its ability to easily transfer paper documentation from one office to another in a relatively secure and safe way (emails can be more easily hacked). Although faxing has its benefits, even in today’s day and age, fax machines do not. They can be wasteful, both in extra expenses, like a phone line, and their reliance on paper. With Caltronics’s Network Fax Systems, however, you get the best of faxing and paperless communication in one great product. Network Fax Systems are the solution to how you can bring printing into 2017. Caltronics has partnered with the online fax server OpenText RightFax, the best and most efficient way to send and receive faxes in a way that is even more secure and efficient, while also less wasteful. All you have to do is scan the document you need to fax, and you will be able to utilize your existing email or desktop services to transmit the fax to the other party, along with receiving faxes. But unlike simple email applications, Caltronics makes the security of these documents a top priority, and RightFax adds another layer of protection above emailing sensitive documents. And if you are interested in being fully paperless, document management scanning is another way to make your office paperless and more efficient through the use of cloud systems. Just like network fax systems, document management scanning reduces your reliance on paper printing and filing. It also similarly offers a more secure environment for your most important documents and information. MFPs can save directly into the Document Management System that you utilize, ensuring a perfectly smooth transition with easy organization and easy access to those who are given access, plus measures to prevent anyone else from getting to the documents. Caltronics works with you every step of the way to ensure that you do not experience any issues or unexpected problems during the transition to paperless. If you are dedicated to going paperless and becoming a greener office, Caltronics Business Systems has the tools to make it happen. If you just purchased a brand new Konica Minolta multi-function printer or are considering working with Caltronics to get your own, you may not yet be aware of some of the great services available from Caltronics and your new MFP—services that will make your printer life easier without tons of extra cost or hardware. If your office only prints a few simple things a day like memos, you probably do not need services like variable data printing. But for most offices, you are probably often pushing the printer to its limits. Variable data printing is a way to print the same document multiple times but changing (variable) parts. A simple example is an invoice. With VDP, you will be able to print multiple invoices at the same time, and the printer will do the work when it comes to switching out names, costs, addresses, etc. Production print workflow is another great way to take advantage of the power already within the multi-function printer that you own. Printing can be a complex task that involves different functions and needs from page to page. Chances are, if you already have a printer through Caltronics, your printer has the functions you need to make it a simple task, not one that takes half a day to complete. Not only will you be able to make sure that your printer gives you the personalization you need for each project, but you will also be able to manage the usage and cost. With Catronics Business Systems and Konica Minolta printers, you are assured to have the best printing services available. And with a little practice with the huge variety of features, you will be creating the best print jobs possible. Do not fret if you are still a little confused about how to best utilize variable data printing for productive print workflow; Caltronics is there for you whenever you need them. They take customer service seriously and will work hard to resolve any issue or question you may have. Do you need a new way to make your office more efficient? Keeping up with the competition in any industry is not just about working harder, it’s about working smarter as well. Since you are managing an office, you have much more to deal with than reading up on all of the different services that you could use to make your office run more smoothly. There is one service, offered by Caltronics Business Systems, that every office manager should know: managed print services (MPS). You have probably heard of this phrase before, but do you know the managed print services definition? Below you will learn what exactly MPS means, and how it can help take your office to the next level. Managed print services connect you with a print provider in order to get more in-depth and consistent management and servicing of your print environment. The purpose of MPS is to make your print environment, from the biggest multi-function printer to the scanner, fax machine, small office printers, and anything else, work smoothly and efficiently. Your MPS provider will monitor your print usage (and all of the data that comes with it) and be your go-to source for servicing your printers when they have any issues. MPS begins with an analysis of your print needs before you get started, and then constantly monitors and communicates with you to ensure that when your needs change, the services change to fit those needs as well. Managed print services can also include services that help bring your office further into the digitized world and become less reliant on paper in general. How many papers does your office print in the average week? How often do you need to restock paper and toner? Are there times when needs are higher than others during the year? Are there opportunities to use less resources? If you do not know the answers to these questions, then chances are your office is not running as efficiently as it could be. With all of the different tasks that go along with managing an office, monitoring print usage can seem like a low priority. But clearly the money and resources you can save are well worth it. You also will not have to worry about all of the annoying maintenance issues that you might have before. With Caltronics MPS, you will have a dedicated team behind you who are able to get to your office quickly and take care of any issues, as opposed to either trying to figure it out yourself or having to pay a third party to take care of it, only for the issue to pop up again later. There are plenty of companies that offer managed print services, but having a partner like Caltronics gives you much more than partnering with others in the region. With all of those expectations given in the overall managed print services definition, you need to be assured that you are working with a team that can keep up with them. For four decades, Caltronics has successfully delivered on these promises to clients all around California. If managed print services interest you, contact us to see how we can help your business. This entry was posted in Services and tagged managed print services, mps on March 22, 2017 by riehlt. Decorating the office for particular holidays is a great way to help improve collaboration and teamwork within the office culture without adding any undue stress. And with so many holidays throughout the year, it’s easy to always have a new fun project for those who like to be creative. If your office has a great multi-function printer from Konica Minolta or HP, you don’t even have to spend money going to the store to print out decorations. They can all be done in the office with the supplies you already have. 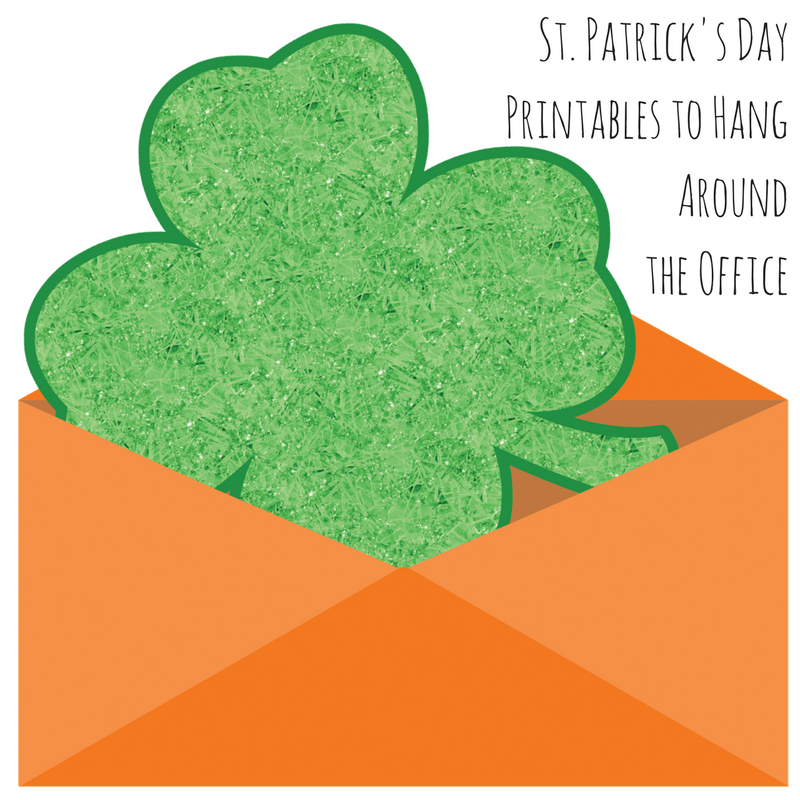 With St. Patrick’s Day coming up, let’s look at some great examples of printables that you and your coworkers can print to hang around the office. Happy decorating! If you are looking for traditional shamrock printables, The Balance has collected a wide variety of free options that you can print from your Konica Minolta MFP with great detail. They feature printables small and large, from banners to pennants, posters, and many more. If your office is hosting a St. Patrick’s Day celebration and inviting kids to join, there are plenty of holiday-themed printables to help keep the day exciting for the kids. This site has a number of great coloring pages, crafts, and other fun ideas for entertaining them that can be printed straight from your office. Hallmark also offers a number of free printables that include both awesome designs you can hang around the office and fun puzzles and word searches with the St. Patrick’s Day theme. And you don’t have to just focus on hanging things up. There are plenty of other great printables to put on desks and to wear. Some examples are shamrock name badges and cards. Trying to create a celebratory spirit around holidays may not seem easy when budgets are tight and expenses need to be kept at a minimum. But with a top of the line printer and Caltronics’ team of experts helping you, you can have the best looking holiday-themed office in the building without any extra costs. This entry was posted in Printables and tagged holiday, office decor, office life, Printables on March 13, 2017 by riehlt.